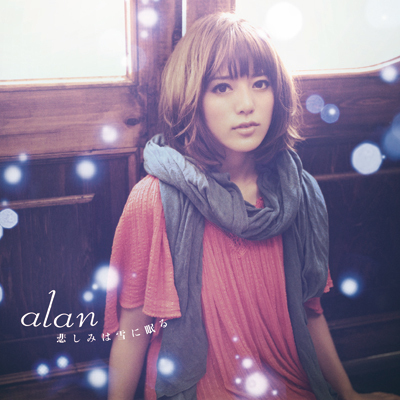 Anyways, this is my second encounter with alan after her songs for God Eater. I was hoping for more hotblooded pop, but some ballads are fine too. As far as ballads go, this one is pretty good. Judging from the album cover, I’m guessing that this is supposed to be alan’s winter single, although it’s technically still autumn. This song certainly sounds wintery anyways. alan’s vocals in this song work well for it, lending the piece a melancholic winter feeling. The melody doesn’t really differentiate too much, relying on the same pitch changes for the majority of the song, but it’s a nice simple melody that’s a pleasure to listen to. The main thing about ballads is, while the melody sounds all nice and good, it’s most likely been done before. Now this second ballad on alan’s single is fairly nice to listen to, but it feels a tad generic to me. Not to say it’s bad, it just feels like that one ballad melody we’ve all heard a million times before. The first track is certainly a better track, as at least that track has its own melody to differentiate itself from other ballads, but this track just feels as if it’s been done before. Well, at least the piano at the beginning of the track is pretty nice.